Matt Hawkins isn't a wizard. He's not a werewolf, either. He doesn't talk to ghosts, though he thinks he might like to see one some day. Matt's just an ordinary, everyday kind of guy. So why is the oldest and meanest vampire in town suddenly gunning--or should that be 'fanging'?--for him? Maybe it's his social skills, or lack thereof--but it wasn't his fault he lost his pants in the middle of the mall. Perhaps it's because he's on nickname basis with the ghoul in the local cemetery. Then there's the outside chance it's the fact Matt's one half of the vampire slaying team that is Night Call. His partner is Mercy, a pint sized fighting machine with a killer wardrobe--and she's the only tame vampire in existence. Still, none of that explains why tenacious PI Erin McRea is digging through all the nastiest moments of his history in an effort to find him. And somehow Matt has to find the time to see his therapist about that little temper problem he has. . .
"The back story is complex and well-developed, adding richness to the plot, there is a hint of romance, and a seriously unusual take on vampires." 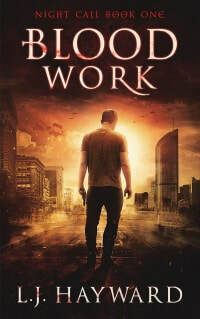 "I am not an avid reader of urban fantasy, but if all those I read are as good as L.J. Hayward's novel I can hardly find a reason for complaint. As a matter of fact, with no consideration for what genre they're fitted in, if all the novels are as least as fun, fast-paced and gripping as "Blood Work" the readers are exclusive beneficiaries of joyful readings." "Blood Work is an ﻿excellent read﻿, and it's a series that I definitely want to continue with. . . . If you're an Aussie who loves UF, I recommend this, not just for the Aussie flavour. And if you're an UF reader who is looking for something a bit different to the rest, I also recommend it. A refreshing worldbuild, characters with interesting backstories, and a cracker of a plot, make Blood Work a must-add to your UF collection."